Earlier this year, on the suggestion of a listener, Carly and I tried bullet journaling as a life-hacking experiment for Straight and Curly. Fans of bullet journaling (or BUJO as they call it) reckon it’s life-changing from an organisational point-of-view. It just made me want to stab myself. So many rules and symbols. So much re-writing/transferring/mucking around. 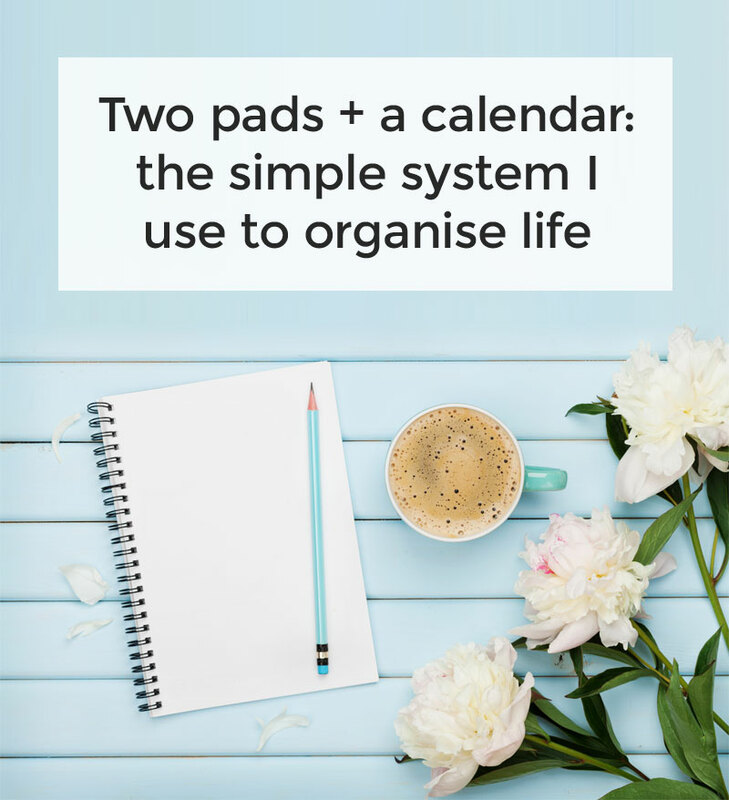 Another reason it didn’t work for me, I suspect, was because I already had a perfectly good system for organising my life – so I didn’t really need a new one. I recently shared the bones of that system (ie my system) in the Straight and Curly Facebook group (it’s free to join so get in there!). Gabby Tozer (fellow author and one of our awesome listeners) gave it a go and gave it the thumbs up. So, on the off chance that my system might be useful to others, (it’s a LOT simpler than BUJO! ), I’m going to share that system with you all today! I kind of feel like it needs a catchy name and maybe I’ll come up with one later, (or maybe you guys have some ideas?!) 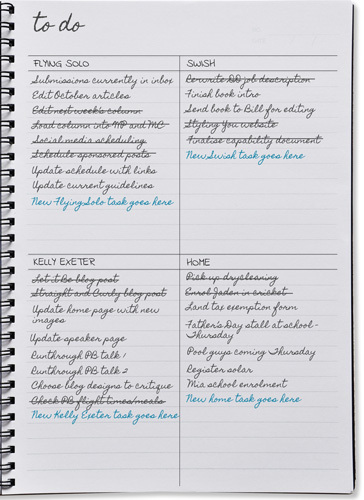 but, for now I’m going to call it Kelly’s Awesome Two-pad System for Organising Life. I know. I should be in marketing. I used to have a big long to-do list of every single thing I needed to do across my whole life. This list was depressing to look at, often ran the length of two A4 pages, and made me feel overwhelmed. Also – when doing my ‘Today’ list for the next day (see below), if the next day is a Flying Solo day (for example) – I can zoom right in on the Flying Solo tasks only. Add back in the tasks I do every week (like blog posts, Flying Solo wrap and report etc). Flying Solo days are Monday, Tuesday and Thursday. Swish Design days are Wednesday and Friday. My Kelly Exeter ‘days’ are the morning hours from 4.15am to 7am. Home admin is generally 7am-8.30am and 4.30pm-7pm. Of course, there is bleed between all of these. It’s not realistic to keep everything within those tight boundaries. But those boundaries are the starting point for my ‘Today’ lists. Back in the day I’d simply create your standard to-do list. Meaning: a long and unrealistic list of all the things I expected to get through in a given day. Then, one day, I was facing a list that was so long and crazy, I actually sat down and scheduled exactly when in the day I would do each task on that list. The first thing that exercise showed me was that I was asking myself to get through eight hours of work in five hours. So I ended up having to bump a few tasks to the next day. The second thing I found was that instead of finishing a task and scanning my list to see which I felt like doing next, I didn’t have to think, I just did the next thing that was scheduled. This also stopped me from procrastinating the hardest tasks to the end of the day when I had the least amount of energy for them. Since that first day of doing my ‘today’ list in this way, I’ve refined the system. I prefer to over-estimate how long something will take rather than work on ‘best-case’ scenarios. I make sure there are buffer periods in there for unexpected things happening (like long phone calls, having to do an urgent job etc). For example, I always schedule an hour for lunch – but lunch never takes an hour. I schedule my hardest/most brain heavy tasks for the start of the day. I create my ‘Today’ lists on an A5 pad and I always do them the night before. 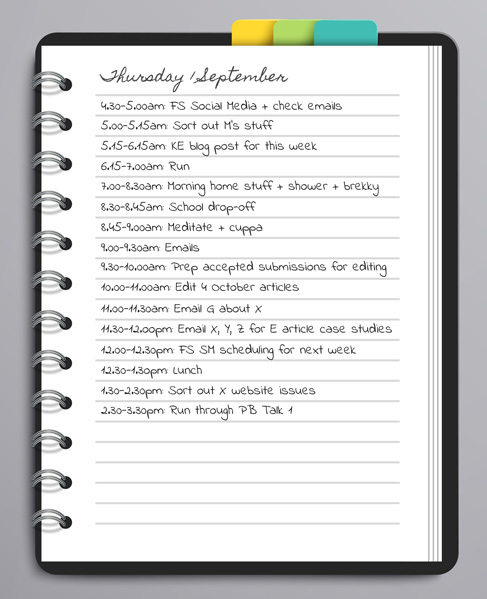 It’s important to note here: you certainly don’t have to schedule out your day like I do. I only do it that way because I’ve found it’s really helped me move more quickly and efficiently from task to task. (I’m easily distracted and my preference is to go check out Facebook ‘for a minute’ after finishing any task!) I’ve also found the above allows me to be more realistic with what I can accomplish in a day. 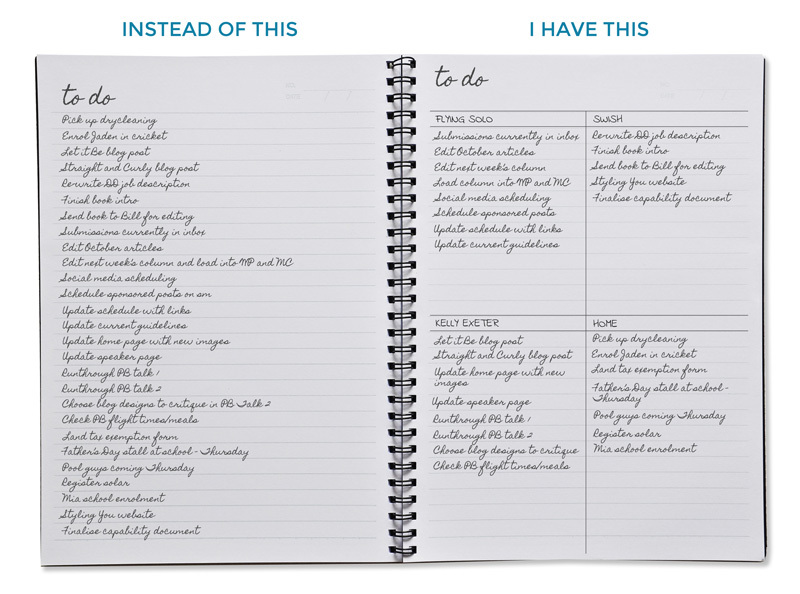 If neither of these things are a problem for you (distraction/making realistic to-do lists), simply writing a ‘today’ list is all you need to do! Those go in my Outlook calendar. 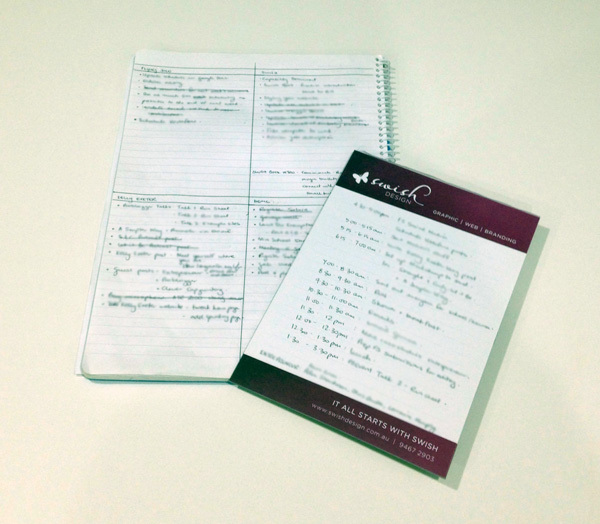 When I’m creating my new A4 list for the coming week, I refer to my calendar and any events/meetings that are occurring in the coming week, they go into the appropriate area on the A4 list (and then, into the daily ‘Today’ list for the relevant day). The ones that aren’t occurring in the coming week – I don’t think about them. Gab asked if I put exercise into my to-do list? For me, exercise is a daily non-negotiable that is done every single morning. It doesn’t need to go in my ‘A4’ big to-do list. But, as you can see, it’s in my daily to-do list. Every day! What about big goals like writing a book? But if they’re things I want to do in the future, they don’t live anywhere except my head. I find if I write something like that down before I’m in a position to do it, it just taunts me and I don’t like things, especially TASKS, taunting me! As you can see, it’s not pretty or Pinterest-worthy, but it is simple and ridiculously effective. It allows me to feel on top of life (which reduces anxiety and stress). 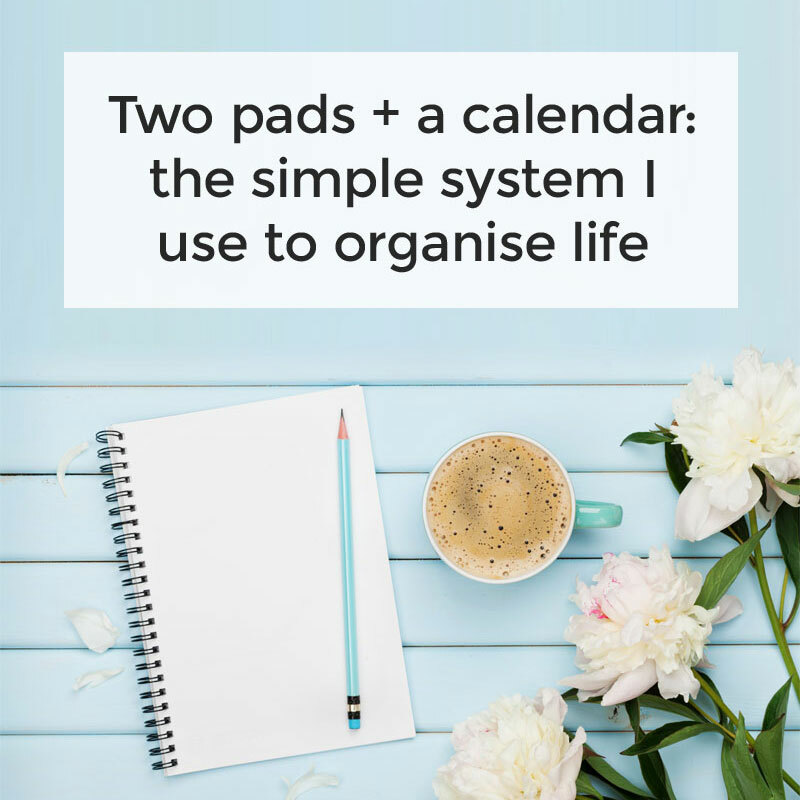 It allows me to be really productive with the hours I have available to me (which gives me the ability to schedule more whitespace into my days). And, perhaps most importantly, it makes me a nicer person to be around on a daily basis. Which is especially important to the people who live in a house with me and work with me.